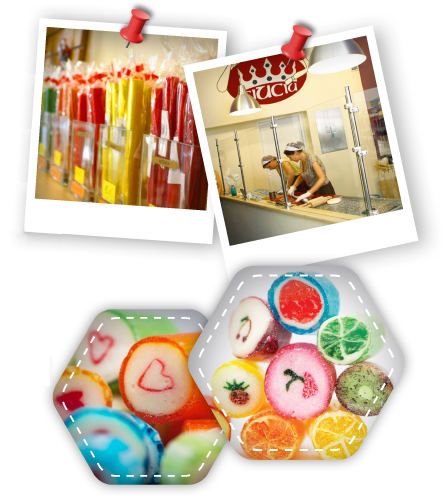 The Ciuciu Cukier Artist is pleased to invite you to the Smallest Factory of Sweets in the World. We produce our sweets by hand on the basis of the technology taken from small manufactures of the 17th and 18th century. Our Little Factory is second in Poland by the Gdańsk manufactory. We are probably the Smallest Factory of Sweets in the world, since we have scarcely 50 square metres of surface to work on. We would like to invite all Children and Adults to the Grodzka Street 38 in Cracow to the Land of Sweets. During our shows you can watch from the very beginning till the very end how we create our candies and lollipops. During the production process you will have the opportunity to feel the airborne aroma of caramel. At the end of the show you will try still warm sweets. Moreover, we take active part in the fair and markets, as well as different events held all through the year. All our sweets are manufactured 100% by hand, without amendments, using only and exclusively natural food colourings. Our sweets are gluten free.